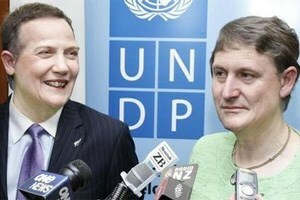 John Key has finally metamorphised completely into Helen Clark, with a bunch of sleight of hand smoke and mirrors give aways that are no doubt making NZ’s arch socialist wrecker smile smugly as she looks down from the heights of her plush UN office in New York. “The National-led Government has focused on ensuring gains from our growing economy flow through to families and these measures demonstrate that. The following policies come into force from April 1. The Government’s new HomeStart scheme to help around 90,000 Kiwis into their first home over the next five years. Paid Parental Leave to increase by two weeks to 16 weeks – and by another two weeks from 1 April next year. The parental tax credit to rise from $150 a week to $220 a week, and the entitlement increases from eight weeks to 10 weeks. Average ACC levies paid by employers and self-employed people will fall to 90 cents per $100 of liable earnings, down from 95 cents. New Zealand Superannuation to increase by another 2.07 per cent – meaning it has increased by 31 per cent since April 2008. This is double inflation in that time. The adult minimum wage to rise from 14.25 an hour to $14.75 an hour – a 3.5 per cent increase. These measures build on the policies we’ve implemented over the past seven years to help New Zealanders get ahead,” Mr Key says. Looking ahead, there are more policies designed to help families which take effect from 1 July. These include children under 13 having access to free GP visits and free prescriptions, and the average ACC levy for a private motor vehicle falling by around $135 a year. Note the emphasis on “responsible economic management”. We’re obviously going to have that phrase pushed down our throat right up until the next election. Note too the use of the word “free”, a typical socialist confidence trick that I have alway said should be outlawed. It is not free Helen Key, it is taxpayer funded. Just typical socialist drivel, and as I would criticise any Labour govt who implemented these measures, so I will criticise National. The only concession that escapes this category is the reduction in ACC levies but this has been advocated for some time by dept managers who long ago stated the charges were far too high. And as I said the other day, the Key govt cannot at all substantiate its claim to be “good economic managers”. The so called “booming” economy is being driven by very unpopular mass immigration. End of story. Typical left wing politician, it is nothing but socialist welfarism couched in nice sounding words, and enough studies have shown how destructive welfarism is to both families and individuals.